In case I have not mentioned this before, I am a Swede. (NOW, you get the headline pun! Sweet and thankyouverymuch!) Swedes, generally, are hardy folks – really good at surviving in the cold. So it goes without saying we make great HOT Chocolate. We also have a very ironic sense of humor, so COLD chocolate on a freezing winter’s day is also right up our alley. The secret is this “magic” chocolate powder called O’Boy, that is added to hot or cold milk to make THE BEST hot or cold chocolate milk. So, if you are lucky enough to live in Sweden (shout-outs to Andi-Umpa och Eeesa, mormor och Bu, all the cousins, and Jonas with Family [keep working those perler beads!]) 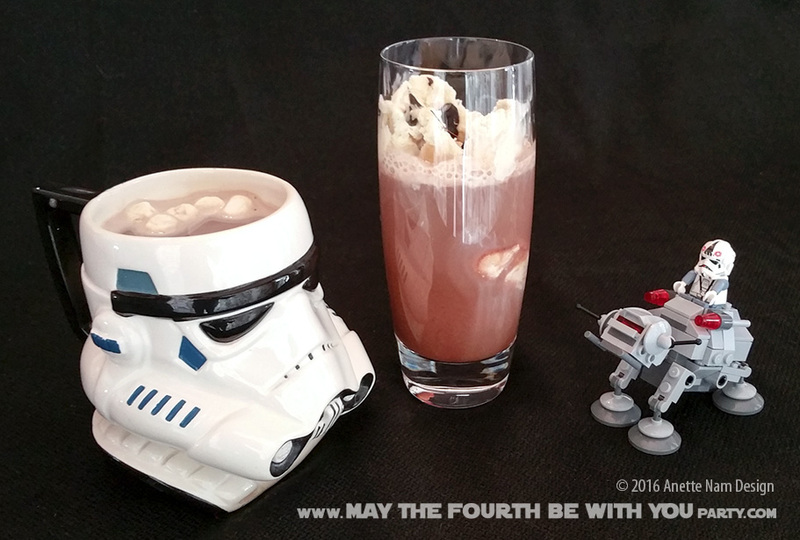 then you can make Hoth Chocolate the way it was meant to, with O’Boy! If you live anywhere else, well, you CAN find it imported on Amazon but it is pretty pricey. So Chocolate Syrup might have to do! Needless to say the Hoth Chocolate is best with Wampa Cookies! Click here for recipe! A note on the name “Hoth Chocolate”: The Hubby came up with this name for us a while back, but we now know that it has also been used in other places, such as the book, The Star Wars Cook Book: Wookiee Cookies and Other Galactic Recipes (A great food resource if you plan on having a Star Wars party) and the Star Wars Galaxies Trading Cards . The glass is called “Otis” and from Crate and Barrel years back, but it looks like they still have it. The Stormtrooper mug is easily 15 years old, but they sell very similar ones on Amazon.